Hands-free gentle warm dry air is activated for cleansing action which starts with just a touch of a button. Three adjustable settings are available. Also, its soft warmed seat is designed to give maximum comfort and relaxation at your desired temperature. BB-600 is an advanced version of BB-500. Its newly updated design and technical features are really a futuristic step taken in this niche of products. The Bio Bidet BB-600 is an entry-level electronic bidet that rivals any bidet on the market with its abundance of features and peace of mind backed by Bio Bidet engineering. Bio Bidet BB-600 Ultimate bidet seat offers full features and functions. Convenient dual nozzle for feminine and posterior wash and built-in special motor adds aerated bubble into water stream for soft yet efficient cleansing. 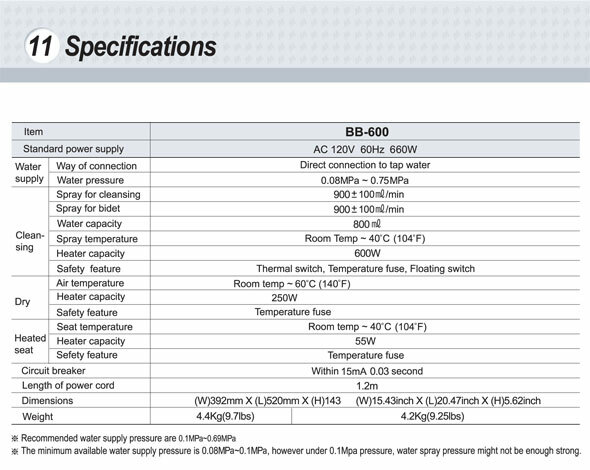 Bio Bidet BB-600 adapted water tank with continuous water heating technology. Unlike other water tank type bidet seat, it is design to maintain its water level even while in use. Its heating mechanism almost instantly heats incoming water for continues warm water supply in extended time period yet, its maximum power consumption is less than 600 watts which is lower than some of water tank type bidet seat even without instant water heating elements. Bio Bidet BB-600 Ultimate Bidet Seat Control Panel is ergonomically and intelligently designed for easy and efficient operation. All new BB-600 is designed to fit any toilets including 1pc and 2pc toilets. Its is fully functioned bidet seat with two nozzle, warm air dry, pulsating massage, oscillating wide clean, kids, auto wash, hydraulic heated seat and much more. All this functions and features available for you at your finger tips. Shape of control panel follows exact contour of the bidet seat body for easier operation as well as for esthetic purpose. Each large buttons with extra space around them for easy identification and operation. Press to change all pre-settings to lowest including water temperature, pressure and dry temperatures. Wash, Oscillating Wash, Dry function will operate automatically. Each cycle last approximately for 20 seconds ni 60 seconds totoal operating time. For auto wash for bidet function, press bidet then press auto. Press to activate Power Saving. Unit will be in economy mode after 1 hours from last usage. In economy mode, temperature of water and seat will be kept to 30C and LED will turn Green to indicate economy mode. As soon as seat sensor activates or power saving button is pressed again, unit will be in wake mode and return to settings used in last usage. 2. Oscillating is highly effective for optimal cleansing. 3. Optimum usage is about 15 seconds at a time with medium temperature and pressure. 4. Remove excessive water in gentle tapping motion using toilet paper. No wiping. 5. At medium heat and air setting, use dryer for about 15 seconds. heater. Water temperature and pressure is electronically regulated for consistency. A. BB-600 is designed to fit most 1 piece AND 2 piece toilets. Its compatibility is over 98%. professional sales reps. for detail. Bio Bidet BB-600 Ultimate Bidet Seat is UL and CE certified complying all safety requirements. With one of the highest water tank capacity, BB-600 adapted continuous water heating system that extends total time in supplying continuous warm water. Continuous water heating system is unique technology keeps on filling cold water with instant heater within 600 watts heater capacity. Its direct connection type of water connection allows easy installation. How to install Bio Bidet BB-600? Easy as 1, 2, 3. For More Installation Information, please refer to Owner's Manual link below.